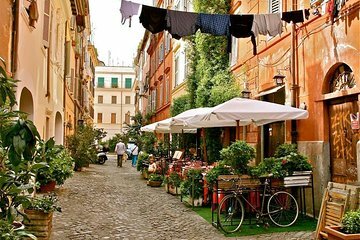 Recorra un encantador laberinto de calles estrechas y plazas antiguas en un recorrido en Segway de 3 horas por el barrio de Trastevere en Roma. Descubra las capas de la historia que han dado forma a este bolsillo bien conservado y vea sus monumentos más cautivadores, como el Palazzo Corsini, el Teatro Marcello, la fuente de l'Acqua Paola y la Basílica de Santa María en Trastevere, una de las iglesias más antiguas de Roma. Recorra distancias mucho más largas de lo que lo haría en un recorrido a pie, y escala fácilmente una colina que conduce al mirador Gianicolo para obtener vistas panorámicas del Vaticano. Explora uno de los distritos más singulares y encantadores de la ciudad. Segway is a great way to tour Trastevere. Thanks to Flávio and Juliana who are our expert guide, both historically and with the use of the Segway. My friend and I enjoyed the experience. Its like having a private tour. It was great experience with a lot of wonderful information about the city with our guide Quentin who was more than great showing us around and answering our questions. We enjoyed our time a lot. Super guide. Super fun. A must do! Dario was our guide and was FANTASTIC! He was very knowledgeable about the history of Rome and really made this the highlight of our trip! There were only two of us plus Dario on our trip, so it was very personalized. We were doing other Rome tours and chose the Trastevere tour to get somewhat our of the mainstream. We took the 4:00 pm tour on a full moon night and it was spectacular! I would HIGHLY recommend it and ask for Dario! Note: I originally booked this tour through Viator.com and the service was fulfilled by a local Segway company..
We took the Trastevere tour and had a great time. Our guide, Quentin, was friendly and very knowledgable about the area. I'm glad we did this by Segway because climbing up the hill in the heat would have been exhausting, and we would have missed out on the incredible view of the city. It ended up just being the two of us with our guide, so we were able to stop and go as we pleased. Quentin took us to sights on both sides of the river and even recommended a great restaurant for lunch. I highly recommend a Segway tour near the beginning of your trip. You can cover a lot of ground easily and figure out what you want to go to again later.